Modern Street Lamp set from MIG Productions contains two... yes, you guessed correctly: street lamps. The set comes in a plastic resealable bag with a thick paper flap stapled to it. Pictures on it show completed lamps with one of them nicely shining - of course resin parts don't shine, so someone most likely enhanced the picture with photo editing computer program to get this effect. Each of the lamps is split into three sections and fourth part is a solid resin "glass" for the lens. There is minimal amount of excess resin to remove from two bottom pieces of each lamp post and larger, but also easy to cut off resin block on upper curved lamp piece. There were several air bubbles on parts, but in places where they should be very easy to fill. Completed lamp is about 24.5 cm high, what translates to about 8.5 meter in 1:1 scale and seems to be quite correct size. 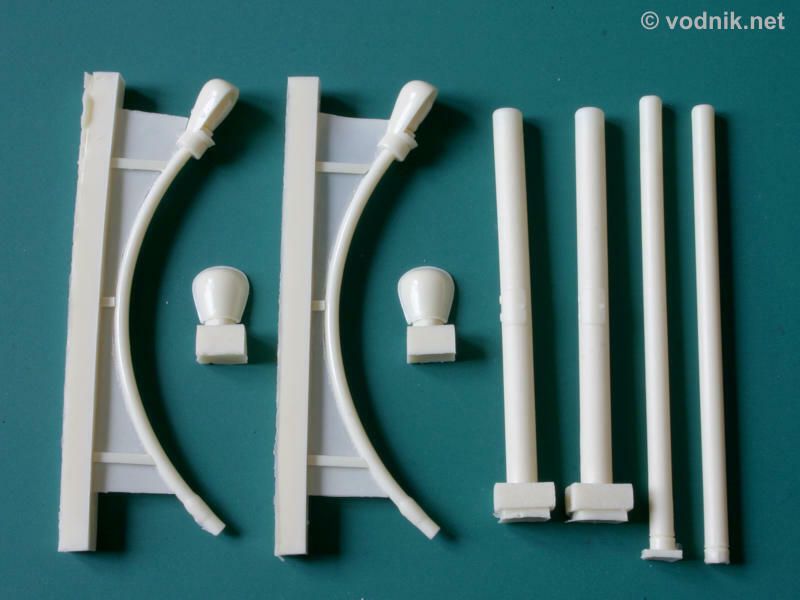 Three lamp sections fit telescopically into each other so the complete lamp is very easy to assemble, even without using glue. On the paper flap attached to the bag with resin parts following text is printed: "2 optional versions. 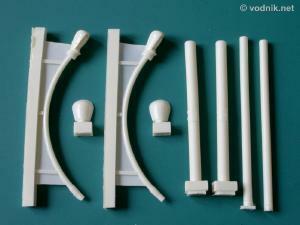 2 resin parts useful for". Unfortunately the text ends here, so we can only guess what was supposed to be written next. "2 optional versions" probably means that lamp can be built either without lens around its bulb or with the resin lens part attached. This part however will not fit to the lamp unless bulb details are first removed. It may also be quite tricky to paint this part to make it look realistic. On the other hand painting the light bulb alone is similarly difficult, even if you don't plan to use lenses. My guess is that those "2 parts useful for" are those resin lenses and they can be used as patterns for vacuforming lenses from clear plastic sheet. That way much nicer and more realistic lenses could be made, but not everyone has skills and tools required to do that. I think MIG could make their product much better should they use clear resin for molding bulb and lens parts. 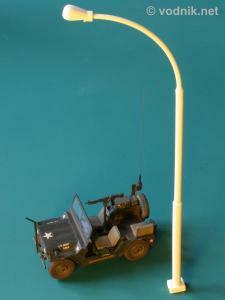 the 1/35 scale model of Ford M151A1 truck. 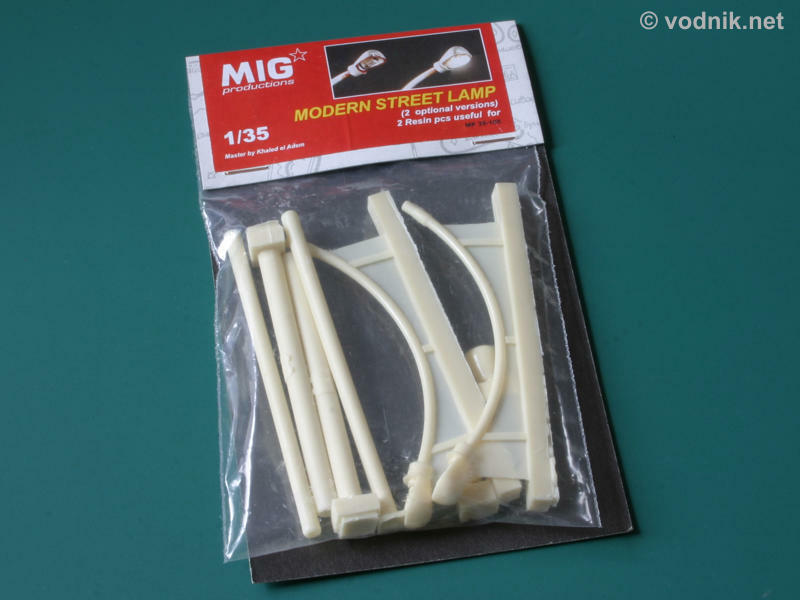 Street lamps from MIG Productions are another high quality product from this Spanish company and can be great addition to many modern dioramas. I'm not sure in what country this exact style of lamps can be found, but they will look fine on Balkans and Middle East dioramas, obviously including Iraq ones. They could be even better with some clear parts included, but more skilled modelers can add them themselves and others can always try to achieve convincing results with painting. You can also remove the light bulb entirely and build your lamps as completely destroyed, avoiding the tricky "clear" parts use. Recommended!